Hot off the ESID press: “Public sector reform in Africa: Understanding the paths and politics of change”, ESID Briefing 28, Deceber 2017. This briefing explores why some states in Africa seem to be stuck in a spiral of corruption and institutional weakness, while others build effective bureaucracies that are able and willing to tackle the challenges of development. Drawing on research from ESID’s PSR project, it compares the public sector reforms of Ghana, Uganda and Rwanda during the period 2000-15. The three countries exhibit different kinds of political settlement, which makes for a useful comparison of how national-level politics filters the diffusion of transnational norms. This helps to build a more nuanced understanding of the varieties of state-building in Africa, and provides some policy implications for reformers. Purely institutionalist explanations cannot explain variations in African state-building in the 21st century. There are different paths to change, like Ghana’s fragmented reform under competitive clientelism, Uganda’s cosmetic reform under a decaying dominant party, and Rwanda’s directed reform under a dominant political settlement. Understanding these paths requires a theoretical framework that highlights the contested nature of the PSR policy domain, the effect of political settlements on elite time horizons, and the ideational fit between transnational policy ideas and elite ideologies. In two weeks I will be storming Philly’s city center as part of the ESID contingent attending the annual meeting of the American Political Science Association. We are finally taking our framework and findings across the pond to have a proper conversation with leading lights of American political science, and in particular comparative politics. Our panel session includes such heavyweights as Atul Kohli, Jennifer Widner, and my own PhD advisor Nicolas van de Walle (the links are for those poor souls who don’t know these scholars already). On our side we will have Kunal Sen, Sohela Nazneen, and Abdul-Gafaru Abdulai. The topic for the day is “Beyond the ‘new’ new institutionalism: debating the politics of development”, which fits quite nicely under APSA’s theme for this year of “Great Transformations: Political Science and the Big Questions of Our Time”. ESID is definitely fond of big questions, and it does not get any bigger than that. I have been asked to serve as a translator or pontifex of sorts for that panel, albeit briefly. Because of my fixation with blurred disciplinary boundaries and academic amnesia, I have the task of briefly articulating the potential bridges between ESID’s core framework of “adapted political settlements” and more mainstream debates within American polisci. Seeing as I have already thought about this a couple times already, it seemed like a natural fit. Whoever wants to learn what I actually mean by that will have to join us in Philly on September 1st at 4pm. Here’s a recording of our event on Public Sector Reform: Prospects and Challenges in Ghana and Beyond, hosted by the Ghana Institute of Management and Public Administration (GIMPA) on 4 April 2016. A few months ago I wrote about Samuel Finer’s contribution to our understanding of government. Well, there was a point to it: on November 3rd the University of Manchester is honouring him with a conference on the “Development of Government”, through which we aim to discuss Finer’s lasting relevance for current debates on government retrenchment here in the North, public sector reform in the South, and the role of governance indicators in the new SDG global agenda. I will be a presenter on the PSR panel, flanked by far more eminent people than myself, and the programme promises to deliver an engaging day of actual conversation (how un-academic!). Sign up here if you are interested in attending, and keep an eye on the Effective States blog for further information about Samuel Finer and the conference. Sigue leyendo mi post en el blog 3500 Millones (y sígueles en Twitter). Last week DFID’s research team hosted representatives from four research programme consortia on development, including ESID, for a debate and set of presentations on what we have found so far and what – if anything – DFID can do about it. Without going into details – there were surveys, concepts, migrants, onions, and even vampires – it was yet another interesting opportunity to witness that uncomfortable interface between academic and practitioner frustrations. In a very polite and reasoned way, researchers shouted to DFID staff that “context matters, reality is complex, and you’d better take politics into account!”, while DFID staff in turn shouted back that “we too are subject to a political context, and you’d better show us how what you are suggesting would work in practice!” Of course, this being a professional event in the UK, there wasn’t any actual shouting; but one could sense the deep-seated frustration, misunderstanding, even recrimination underlying the entire event. Eventually, we ended up where all these meetings seem to end: with the realization that everyone needs to do more to facilitate stronger researcher-practitioner linkages. Which is not a bad message at all. But it still makes me wonder what comes next. 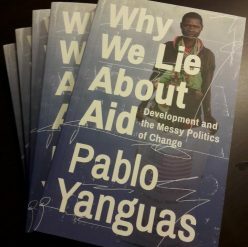 Continue reading What comes after all the shouting about politics and aid?